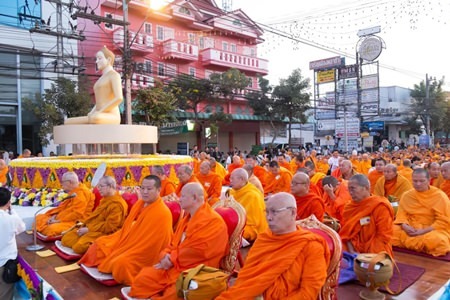 Over 10,000 monks from four countries took part in the international alms giving ceremony on Charoen Muang Road on December 29, 2014. 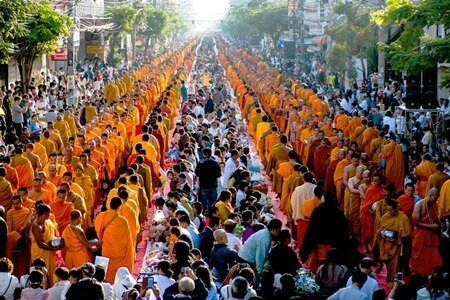 Charoen Muang Road was filled with Buddhist faithful in the early morning hours of Sunday, December 29 as they waited for over 10,000 monks and novices to arrive. The monks came from as far away as Sri Lanka and neighboring Myanmar, Cambodia and Laos to take part in the alms giving ceremony. Bags of goods were piled up for the faithful to donate and senior monks led the ceremony. Chiang Mai Governor Suriya Prasatbuntitya joined the early morning ceremonies. 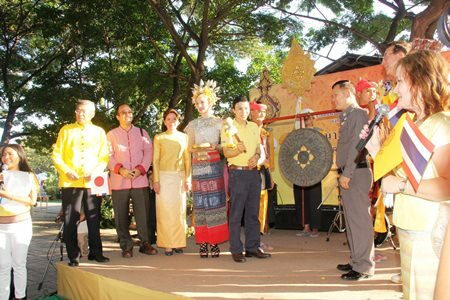 The ceremony was organized by the Chiang Mai Monastery, the Chiang Mai Provincial Administration Organization and other government agencies. Governor Suriya Prasatbuntitya took part in the ceremony, welcoming everyone to the event. Abbots and senior monks led the ceremony. 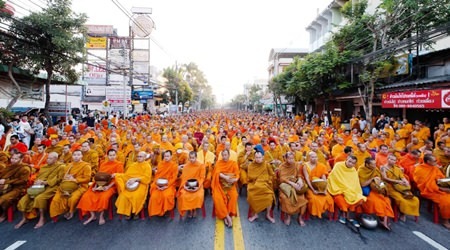 Charoeng Muang road was a sea of saffron robes at 6 a.m. December 29, 2014. Monks lined up to receive alms from Buddhist faithful, many tourists and local residents also took part in the event. Anneliese Yokoyama and Léon Dossé of the Swiss Lanna Society man the entrance with Christmas cheer. 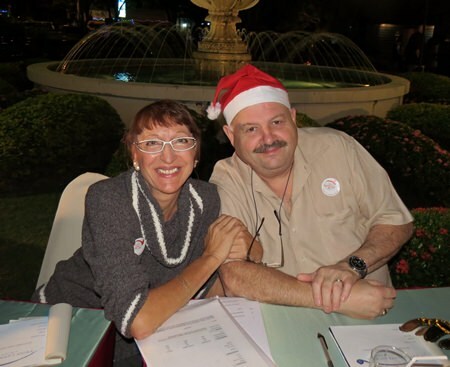 Members, friends and guests of the Swiss Lanna Society held their annual Christmas Dinner on Saturday December 20 in the garden at the Imperial Mae Ping Hotel. 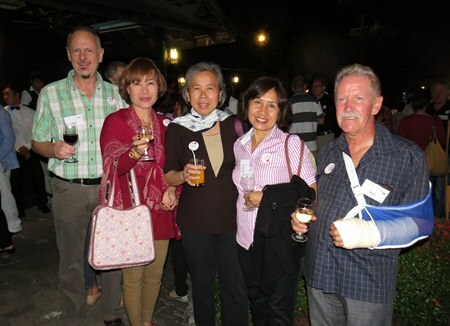 The event saw 115 people fill the garden to enjoy turkey and roast ham along with some Swiss delicacies. Everyone gathered in the front garden to enjoy wine and cocktails before dinner. Santa showed up to distribute presents to children and the hardworking volunteers who keep the Swiss Lanna Society ticking over like a well-oiled Swiss watch. A children’s choir sang Christmas carols for the diners as well. After dinner wrapped up everyone joined in the garden to let loose Khom Loy or sky lanterns to ring in the New Year. The Swiss Lanna Society is a group of northern Swiss residents and spouses and hold weekly informal meetings at the Glasshouse 169 Ratchapakinai Road, 5:30 p.m. every Wednesday. . [email protected] for more information. 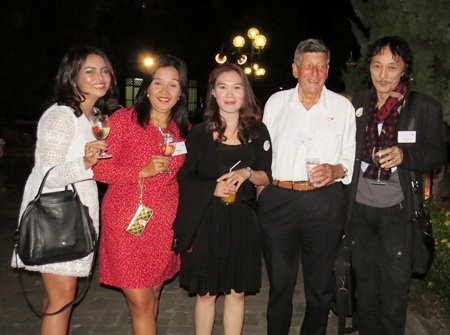 Members of the Swiss and Thai communities joined together at the Imperial Mae Ping for Christmas celebrations. President Andy Mannhartand Heinz opened the gates for the hungry crowd. 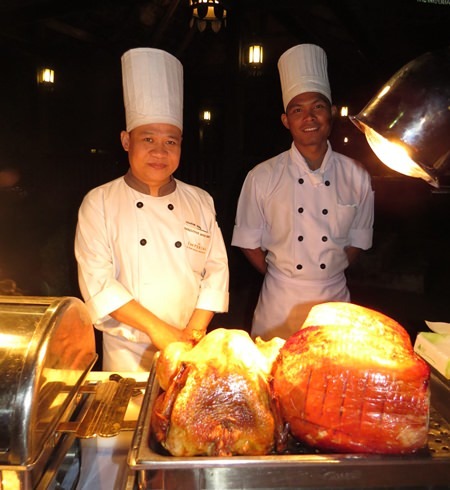 Chefs show off the huge ham and turkey ready for guests. Ready for dinner, the guests toasted to Christmas fun. Swiss Lanna Society Vice President Eveline Willi greets guests at the entrance to the party. 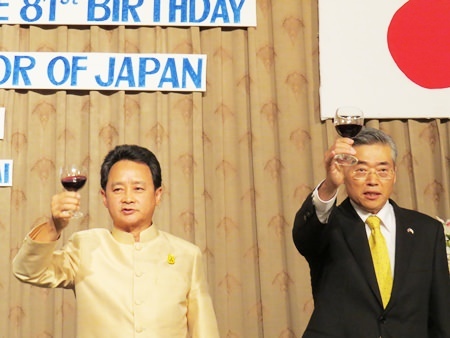 Chiang Mai Governor Suriya Prasatbuntitya (right) and Consul General Akihiko Fujii (left) toast the Emperor of Japan celebrating his 81st birthday. 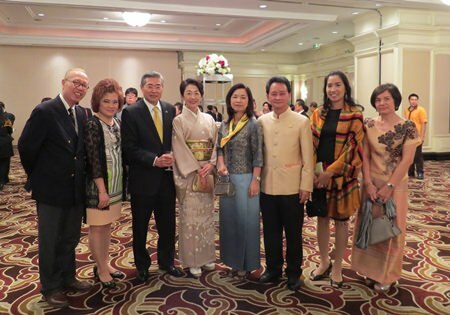 Chiang Mai residents gathered at the Holiday Inn Chiang Mai on December 17, 2014 to honor Emperor Akihito of Japan on the occasion of his 81st birthday. Emperor Akihito was born on December 23, 1933 and acceded to the throne in 1989. He is the 125th emperor of his line according to Japan’s traditional order of succession. 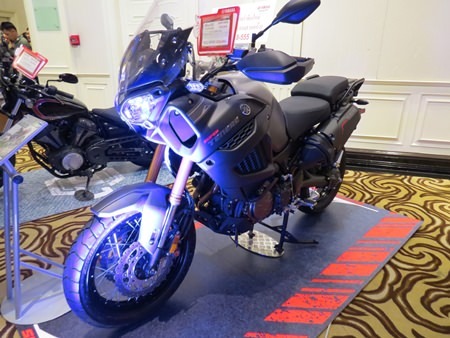 Guests were delighted to an arrangement of big bikes from Japan including Suzuki, Honda and others. Guests took their photos with the big bikes as they waited to take their photo with Consul General Akihiko Fujii and his wife. 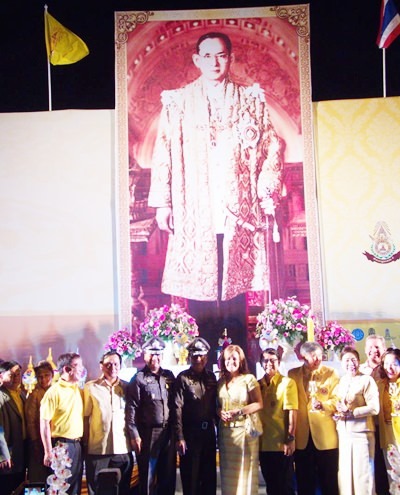 Governor Suriya Prasatbuntitya took to the stage to congratulate the Emperor and the people of Japan on his birthday, citing the close ties between the two countries as well as two Royal Awards given to Emperor Akihito; the Most Auspicious Order of the Rajamitrabhorn and the Most Illustrious Order of the Royal House of Chakri. Emperor Akihito visited Thailand on a first state visit in 1991, the first time a Japanese Emperor visited an Asia country and again for the 60th anniversary of the accession of HM King Bhumibol to the throne. Consul General Akihiko Fujii then spoke on the close relationship with Thailand and the many projects supported by the Japanese government in the North through their grassroots project program, speaking in fluent Thai and then in Japanese, Consul General Fujii was eloquent in his affirmation of the importance of Chiang Mai to Japan. The national anthems of both countries were played and the guests toasted Emperor Akihito for his birthday and then HM King Bhumibol Adulyadej. Consul General Akihiko Fujii and Governor Suriya Prasatbuntitya are joined by Chiang Mai media and business people at the party. 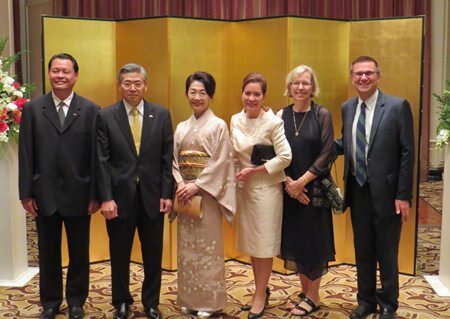 Jakarin Wangvivat (far left) Honorary Consul for Canada joins Michelle Heath, wife of U.S. Consul General Michael Heath, and U.S. Consular Chief Mark Carlson are welcomed by Japanese Consul General Akihiko Fujii and his wife. The entrance to the party was lined with big bikes from Japanese makers. 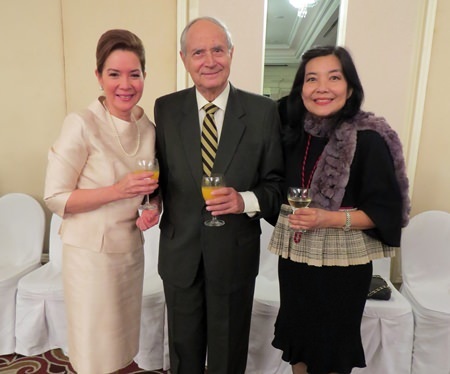 Former Greek Ambassador George Sioris and his wife Oy chat with Michelle Heath. 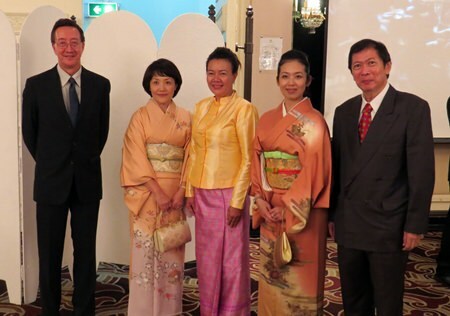 Honorary Consuls Ben Svasti Thomson and Agkarajit Phanomvan na Ayudhya and his wife with lovely ladies in Japanese kimonos. Chiang Mai Mayor Tussanai Buranupakorn is joined by police, consuls and organizers to hit the ceremonial gong to start the parade. 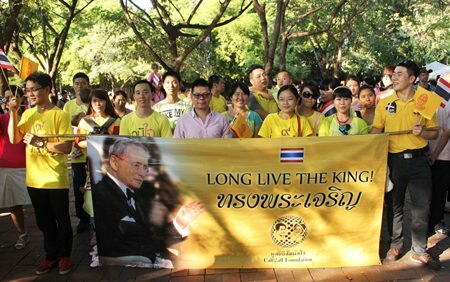 The community of Chiang Mai turned out for events honoring HM the King for his birthday for several very busy days starting with the International We Love the King Parade and Celebration on December 3 to official ceremonies at the Chiang Mai University Convention Center, Sala Klang and at Tha Pae Gate on December 5, 2014. The first event on December 3, 2015 saw over 2,000 people take part in a parade on its 4th year this year. 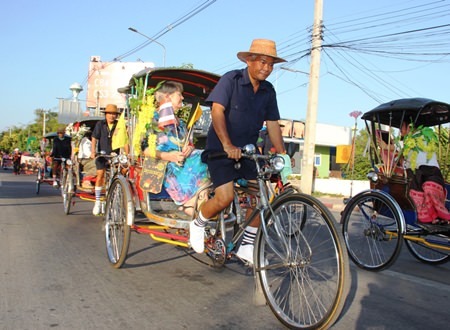 Organized by local residents, both Thai and foreign, the event gives everyone a chance to honor His Majesty in a public parade and candlelight ceremony. Mayor Tussanai Buranupakorn was joined by Akhiko Fujii, Japanese Consul General and Michael Heath, U.S. Consul General, at both the opening and the parade which started from JJ Market and ended at Tha Pae Gate where Acting Commission of the CIB, Royal Thai Police Pol. Lt-General Prawut Thawornsiri presided over the ceremony joined by Acting Commission of Region 5 Police Pol. Maj. Gen. Thanitsak Theerasawas, Consuls- General, Consuls, Honorary Consuls, leading Royal Thai Army officers, Wing 41 officers, and multinational groups from around Chiang Mai including members of the American, Canadian, Scottish, Irish, Filipino, Burmese and German communities among many others. The evening ended with a beautiful candlelight ceremony with everyone singing the Royal Anthem after distinguished members of the community took to the stage offering their birthday wishes to HM the King and phan phum or offerings, to the portrait of HM the King. There were also music and dance performances including one by a talented local Nepali girl. Members of the local community joined together to show their love and respect for HM the King. 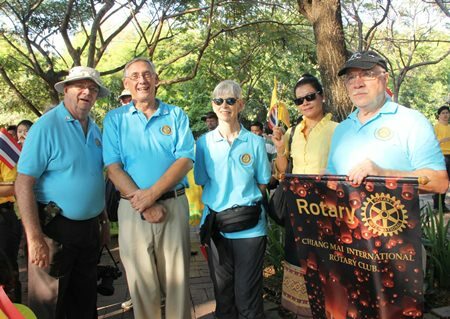 The Rotary International Club of Chiang Mai joined in the parade on December 3, 2014. 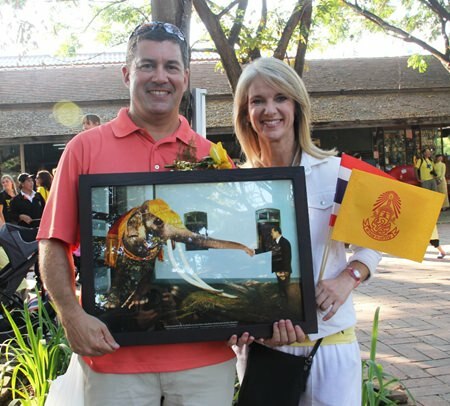 Marchers were encouraged to carry portraits of His Majesty the King, This couple came with their favorite photo of His Majesty and an elephant. 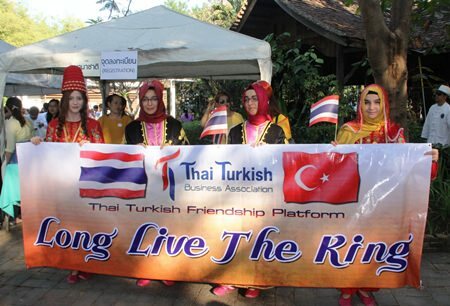 Members of the Thai Turkish Business Association wore native costume in the parade. 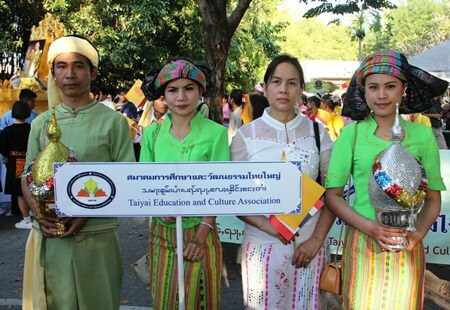 The Taiyai Education and Culture Center joined the event with local members wearing traditional clothes for the parade. Even the littlest fans of HM the King joined the parade. 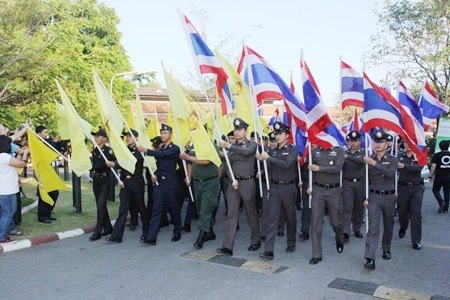 Members of the armed forces including Army, Air Force and Police carried flags of Thailand and the Royal Flag. British Honorary Consul Ben Svasti Thomson and American Consul General Michael Heath joined the parade along with Japanese Consul General Akihiko Fujii and other consuls. Samlors joined the parade carrying local residents along the route. Miss Chiang Mai International joined the parade. 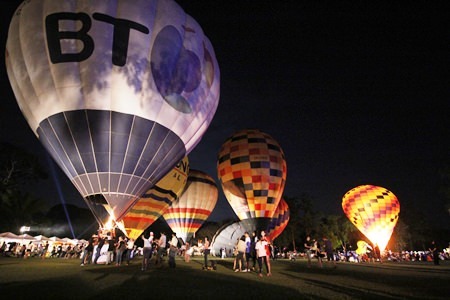 The Chiang Mai International Balloon Festival filled the skies of Chiang Mai once again as balloons took flight early morning on December 6 and 7, 2014 before returning to the Chiengmai Gymkhana Club for a fabulous light and sound show at night. There were booths selling food and drinks along with local businesses and charitable projects, a magician and dog show along with a large bouncy castle and donut shaped air filled balls that kept the kids entertained. Adults stuck around for the light shows as the tethered hot air balloons flashed their fires for a night glow show to music followed by fireworks. 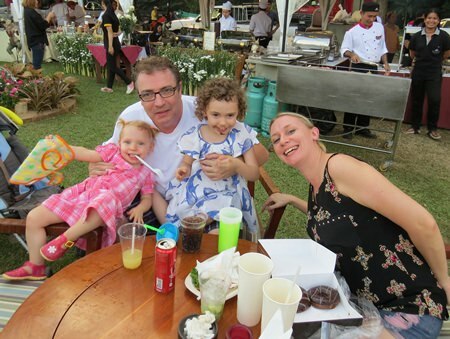 Chas and Rachel enjoy the festival with their two daughters, the festival had many great food booths from local hotels and restaurants. 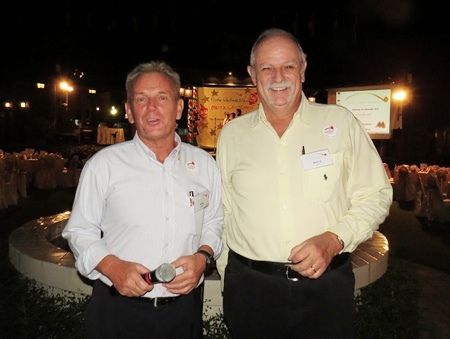 Additionally the Chiang Mai International Rotary Club held a golf ball drop fundraiser, with over a hundred golf balls dropped from the tethered balloon by Laurence O’Keeffe, the winner won a 30,000 baht cash prize. 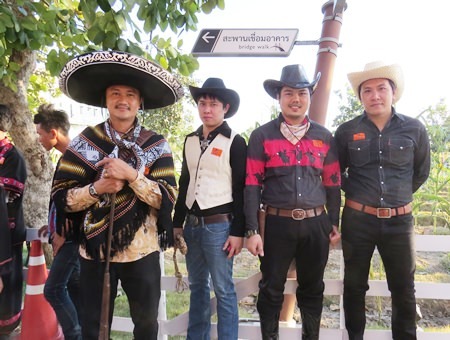 The fundraiser earned the club over 100,000 baht to fund service projects such as eyeglass clinics with AmigoVision Thailand, the Mae Tao Clinic and others. 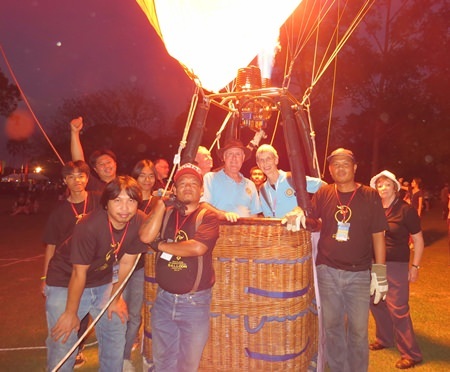 President Roger Lindley said the club was thrilled that in their very first year they were able to hold such as successful fundraiser and thanked event organizer Napassanan Aom Krainara for all her help and support in letting the club use one of the balloons for the drop. 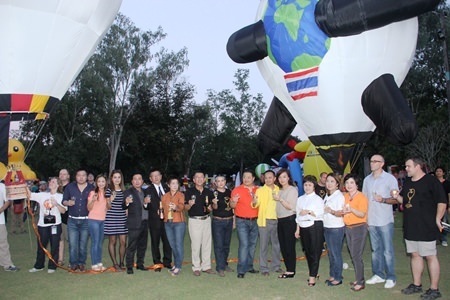 Chiang Mai Rotary International Club members Laurence and Patty are joined by team members of the balloon that carried them over the golf course to drop golf balls for the club’s fundraiser. 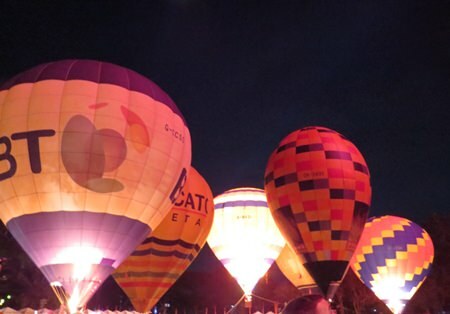 The International Balloon Festival entered its 12th year this year and offered full size and mini hot air balloons and tethered rides for lucky draw winners. The event featured music from international acts like Drums United from the Netherlands, Neung Lakkawal from Thailand and others. 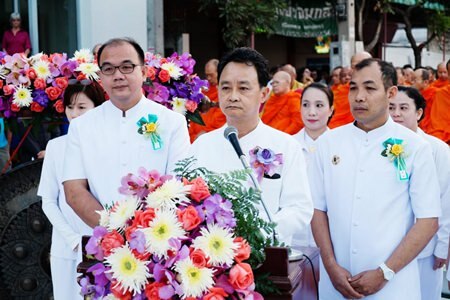 The grand opening ceremony was presided over by sponsors including Provincial Administration Organization President Boonlert Buranuapakorn and visiting TAT Dubai Director (and former Chiang Mai head) Chalermsak Suranont. 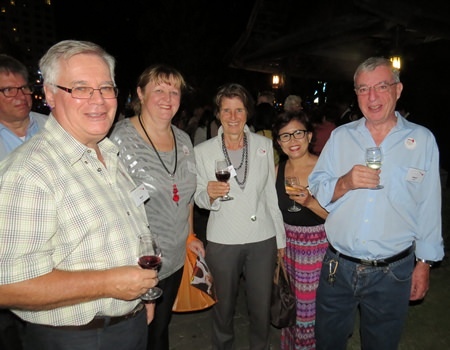 President Boonlert welcomed the visitors to the event noting that this popular event was a great event for Chiang Mai offering fun for the entire family. The night glow show was spectacular, filling the Gymkhana Club with glowing balloons and music. 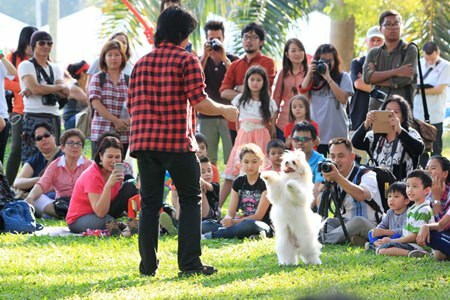 Magicians, clowns and a dog show kept the kids entertained. As the night fell the balloons inflated to put on the light and sound “nightglow” show. 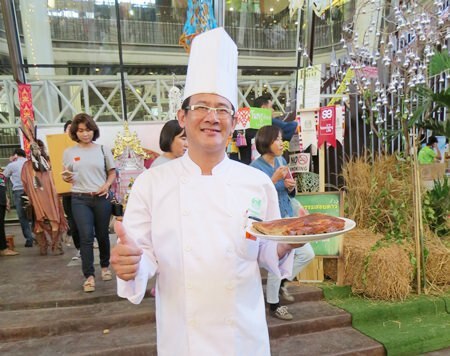 Rimping Executive Chef Khun Noppaklao Kengkoompol offers up delicious food for visitors to the Rimping in the Park. The highly successful Rimping in the Park returned to fill the middle plaza at Promenada Resort Shopping Mall at the end of November and saw throngs of people enjoy food and drink tastings including everything from locally produced goat cheese, take me home tomatoes, sausages, chicken, ice cream and many many other delights. Also on hand were local producers selling handcrafted goods, informational booths and more. The huge event was one of the highlights of the local calendar this year as thousands of people flocked to the sold out event. 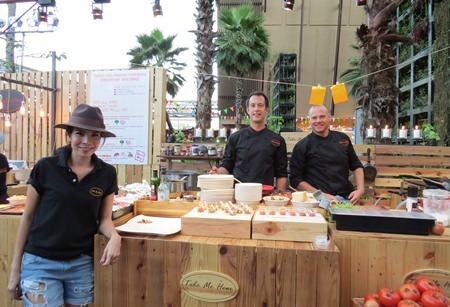 In addition to food and drink there were live music concerts, performances and other events to keep the whole family entertained. 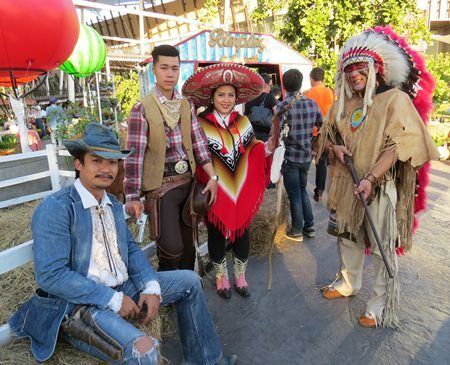 The cowboy theme saw not only vendors dressing up but many visitors got into the swing of things with checked shirts, cowboy hats and actors dressed up in full Native American regalia. Kids loved to see the farm animals and spend time feeding them and petting them too. Everyone said they were really looking forward to the next year’s Rimping in the Park as this one was such a huge success. Cowboys were the theme of the day with these guys presenting a pretty good rendition of banditos. 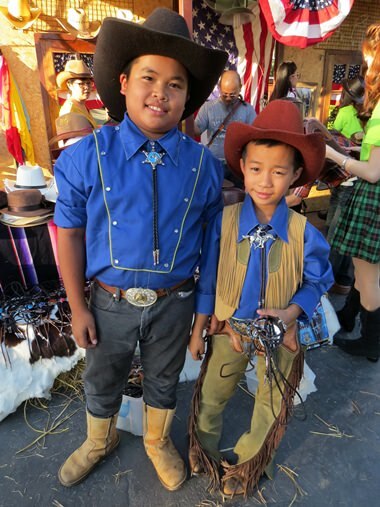 The littlest visitors enjoyed the cowboy theme too, taking advantage of cowboy hats and gear on sale. Take Me Home Tomatoes offered up delicious food with, of course, tomatoes! 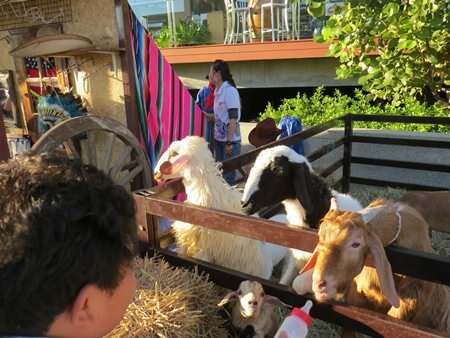 The farm animals were a big hit with many people trying to guess which were sheep and which were goats. These guys went all out with one in full Native American regalia. Or a rendition thereof anyway!